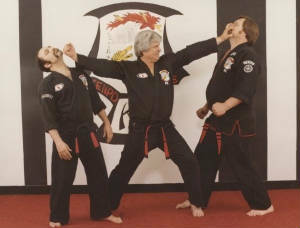 Kenpo Karate was engineered by it’s Founder Senior Grand Master Ed Parker for modern self defence. Some Martial Arts are based on traditional teachings while others are sport orientated. Kenpo though is a true modern self defence system with self defence techniques taught against grabs, pushes, punches, holds and hugs, chokes and strangle holds, combinations of the above, multiple attackers and weapons. Many of the techniques are simple movements that when applied explosively and with accuracy to the opponent’s vital targets are devastating and highly effective key factors in determining survival. Each technique has a name such as Clutching Feathers, Five Swords, Rotating Destruction, Reprimanding the Bears, to facilitate recall of specific techniques. Certain numbers of techniques are taught per belt rank and these can vary from school to school. Gary Ellis Kenpo Karate emphasises principles and fundamental basics rather than on sequences of motion and so the numbers of techniques that are required per belt are less in the early stages. By the time the student reaches 1st Degree Black Belt however they must be able to execute all 154 base techniques demonstrating the principles of self defence and motion that define Kenpo Karate. A self defence technique is a structured situation whereby the attacker attacks in a prescribed way and the defender executes the relevant technique for the attack. This is called the “Ideal Phase” of the Art. Careful examination of the technique reveals many self defence and motion principles and concepts contained within its structure. Each technique tells a story which can be seen from the defender’s, attacker’s or bystander’s point of view. The techniques teach applications of movements (basics) that are practical and highly effective in dealing with an assailant. But they are not designed to be done to the letter on the street, but rather to be used as vehicles to exercise the basics and principles of Kenpo. They are the building blocks upon which the Kenpoist learns the language of Kenpo Self Defence. After learning the alphabet of motion (basics) and the principles and concepts of Kenpo which mould them, then the Kenpoist can create their own words of motion, in other words they create their own techniques spontaneously to deal with any given situation. Kenpo is suitable for all ages and both sexes and many thousands practice the Art throughout the world. It is truly the Art of the Tiger and the Dragon.